Android, iPhone lead Windows Phone 7 by 100 to 1? Sure, the Windows Phone 7 platform has only recently launched and takes time for a platform to built up momentum in the marketplace…but Windows Phone 7 seems to have been struggling to find customers and new numbers from mobile ad network Chitika don’t seem to bode well. 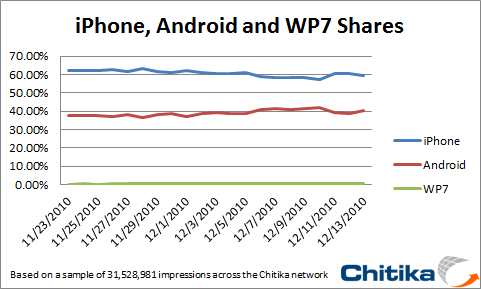 According to Chitika, for every one ad impression it sees from a Windows Phone 7 device, it sees 110 impressions from Android-powered devices and 172 impressions from iPhones. That might not be startling for a platform that’s only just hit the streets, but Chitika notes that those numbers have been “relatively stable” over the last three weeks—meaning during the height of the holiday buying season, they aren’t seeing any significant uptick in impressions from Windows Phone 7 devices. The figures are based on a sample of nearly 32 million ad impressions across Chitika’s mobile ad network from November 23 through December 13, 2010. Chitika’s numbers—with Windows Phone 7 not even cracking one half of one percent of the iPhone and Android’s combined ad impressions—seems to jive with recent industry assessments. Microsoft Windows Phone Program head Joe Belfiore admitted at the D: Dive Into Mobile event that Windows Phone 7 will take years to catch up to competing platforms, and an analyst with investment firm Goldman Sachs recently forecast Microsoft won’t get to even a 10 percent market share in 2011.